Street Conditions: The home is on the end of a Cul-de-sac, and is isolated from all sides. No continuous street exists to any adjacent destination. Driveway: Private driveway made of polished concrete leading to two garage entrances. · outdoor covered verandas additional 60 m2. Ground Floor Bedroom: A ground floor private and isolated master bedroom with a dedicated full bathroom. · 4x12 m with integral in-pool sitting area and 4 high circulation nozzles. · Uncovered pool-area veranda 100 m2 one step lower than covered veranda. · Additional front yard planted with grass and bushes 500 m2 fenced in. 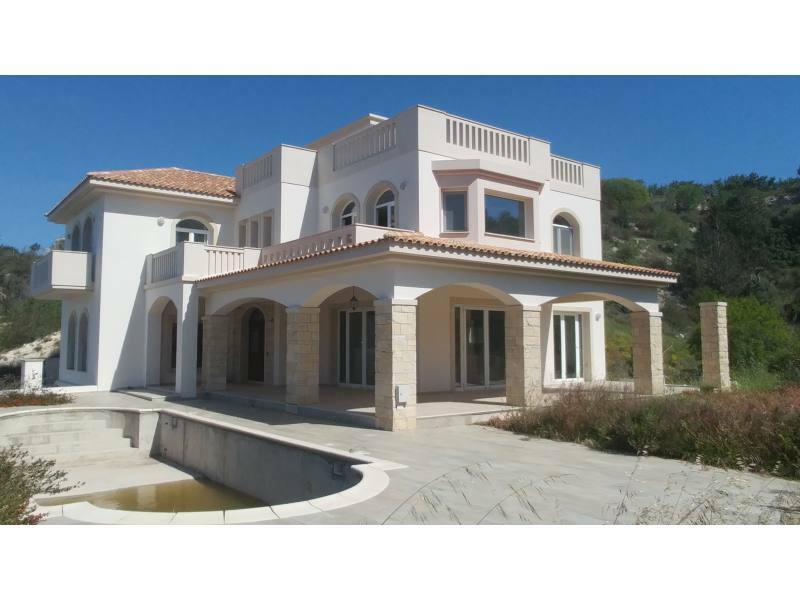 · Adjoined concrete back yard 60 m2 opens to front yard with a garden gate, and to the garage through a locking door. · Rounded stairwell with extra-wide comfort steps (16 cm each). · Wooden railing styled after cruise-ship ending on round window over round overhanging mini-balcony. · a dedicated fully equipped laundry room with a small kitchen. · The laundry-room equipment and its kitchen are all-electric. · All bedrooms have dedicated walk-in closets and dedicated bathrooms. · Each walk-in closet has a rolling shoe closet that can be used as stair-steps to reach upper shelves. · One bathroom has an electronic sauna with built-in audio system, rain shower, and massage nozzles. The steam generator is hooked to a childproofed isolator. · The master bathroom has corner-piece bathtub with shower. · All bedrooms have dedicated balconies. · The master bedroom also has space for a sitting area and an additional dedicated veranda. · The sunroom also has a dedicated sitting veranda. · All verandas and balconies on this floor are uncovered. · The main stairwell leads to the roof where a sitting area 100 m2 allows unobstructed viewing of the 20 km beachfront (7 km away). · The roof garden has a small indoor kitchen and outdoor electric power supply. · It also provides access to the attic space for inspection. · Roof garden and poolside flooring is anti-slip outdoor Italian tile. · Throughout open-floor common areas and in outdoor verandas flooring is Italian large-slab rustic-finish ceramic. · In all bedrooms and in all bedroom balconies, flooring is high luster Italian marble. · All kitchen countertops are star-speckle white granite. · Second and third floor kitchens and the laundry room have polymeric countertops. · All steps are brown Italian marble. · The countersunk fireplace room and the mantle have ornate granite with visible petrified tree-roots. · All interior doors are custom made to a dark oak finish matching kitchen and cabinet woodwork. · All exterior doors and windows are stainless-reinforced UPVC highly insulated with triple-pane windows. · Door and window locking systems are all multi-point engagement mechanisms with safety locks. · hobby workshop with woodworking equipment. · All lighting is LED (~100 bulbs) and fluorescent economy lights. · The heating cooling system uses a geothermal heat pump unit with 6 in-ground circuits in a horizontal configuration distributed throughout the front yard at a depth of 3 m. No deep drilling is allowed, and no planting or trees with deep roots. · All water outlets, showers, and faucets are economy-type with low and high-pressure settings and a maximum discharge of less than 4 lt/min. · The cold water supply system is connected to inline-storage tanks with 5 m3 total capacity, and a auto-power pressure booster. · The hot water system is connected to the geothermal system, and is backed up by a 6 KW 3-phase electric resistance heater. · The entire house has a triple-redundancy IEEE trip switch system pre-approved and post-delivery validated by a private consultant and by a public utility regulatory engineer. Foundation slab size: 15 x 25 x 1 m steel and fiber reinforced slab integrally cast with 12 underground columns diameter 1 m and reaching a depth of 12 m.
· The main kitchen has two ovens (one electric and one gas) and all-gas cook-top sheaf’s range. The fume extractor has LED lights countersunk into integrated wooden hood. · The secondary kitchen has a twin size all-gas standalone range and oven with rotisserie attachment. · The secondary kitchen has two refrigerators, one upright unit for everyday use, and a deep freezer for long-term storage. · The ground floor has five concealed forced air heating-cooling units. Each has its own programmable controller and remote control. Remote controls are identical, and a single one can control the entire house. · A secondary smart terminal is mounted in the kitchen for the main heat pump system. It can be programmed for different time periods and for two time-zones. · The comfort system also can an in-line flow control manifold per floor to facilitate isolation of unused rooms. · Several TV’s are distributed throughout the house. · The matching formal dining room table and storage hatch are limited edition Universal Oriental Empire. · The kitchen table is an antique custom-built in the late 1800’s. · The sunroom furniture is custom built to match a lighthouse motif. Only the bookshelf was purchased independently and does not match perfectly. · One of the children’s bedrooms has a double bank bed with built-in desk and ladder. This is a property advertisement provided and maintained by onlinecyprusproperty and does not constitute property particulars. Whilst we require advertisers to act with best practice and provide accurate information, we can only publish advertisements in good faith and have not verified any claims or statements or inspected any of the properties, locations or opportunities promoted. Onlinecyprus does not own or control and is not responsible for the properties, opportunities, website content, products or services provided or promoted by third parties and makes no warranties or representations as to the accuracy, completeness, legality, performance or suitability of any of the foregoing. We therefore accept no liability arising from any reliance made by any reader or person to whom this information is made available to. You must perform your own research and seek independent professional advice before making any decision to purchase or invest in Cyprus property.